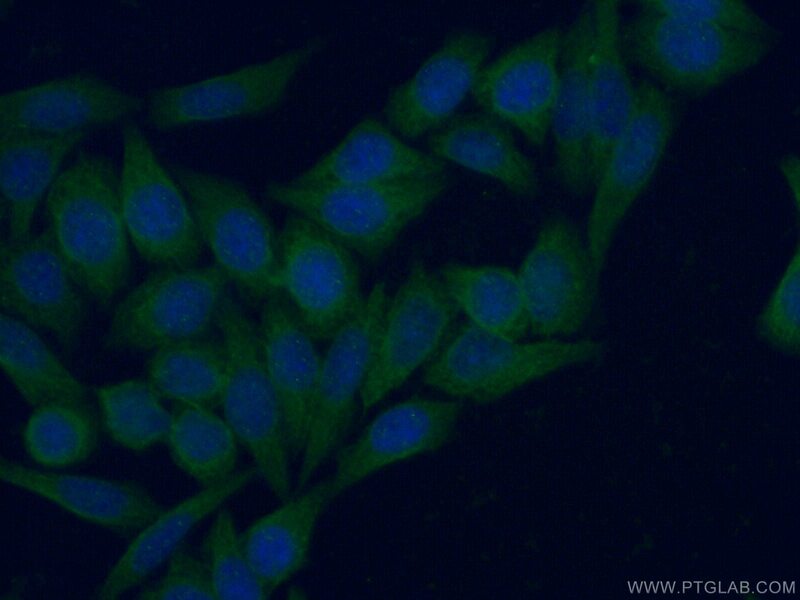 IP Result of anti-ISG15 (IP:15981-1-AP, 4ug; Detection:15981-1-AP 1:500) with HeLa cells lysate 3200ug. 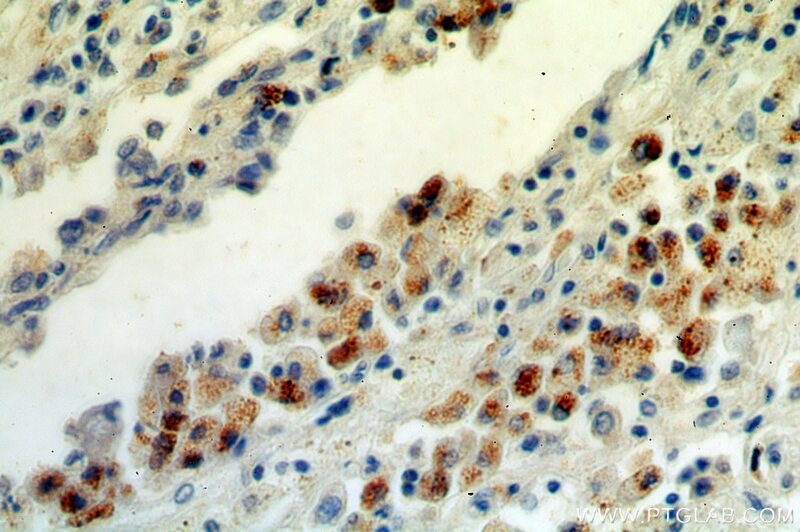 ISG15 is a ubiquitin-like protein that becomes conjugated to many cellular proteins upon activation by interferon-alpha (IFNA) and -beta (IFNB). 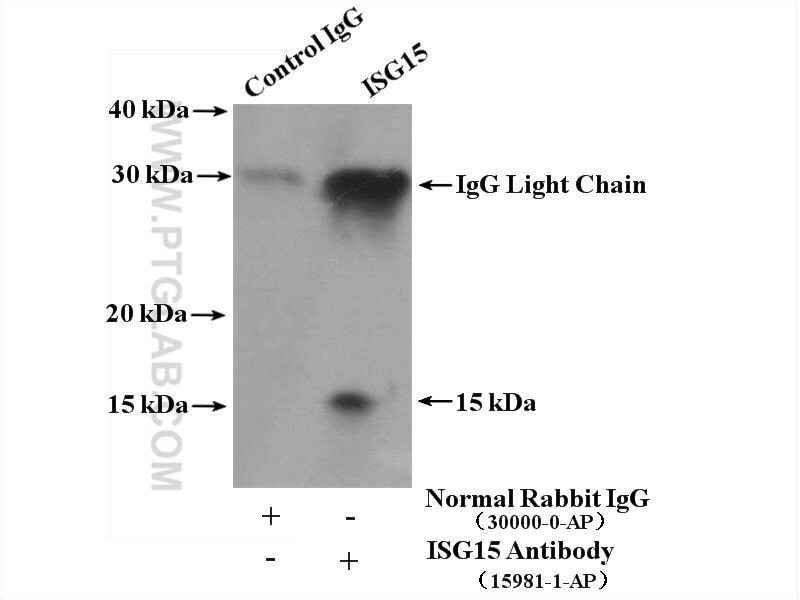 ISG15 forms covalent conjugates with its target proteins in a process called ISGylation, which in mammals is known to play a role in antiviral immunity. ISG15 proteins possess two ubiquitin-like (UBL) domains and a highly conserved C-terminal LRGG sequence, the latter being known as the ubiquitin conjugation motif. Intracellular ISG15 are conjugated, via the LRGG motif, to target proteins through a process called ISGylation, which resembles largely ubiquitination, the process of formation of ubiquitin conjugates. 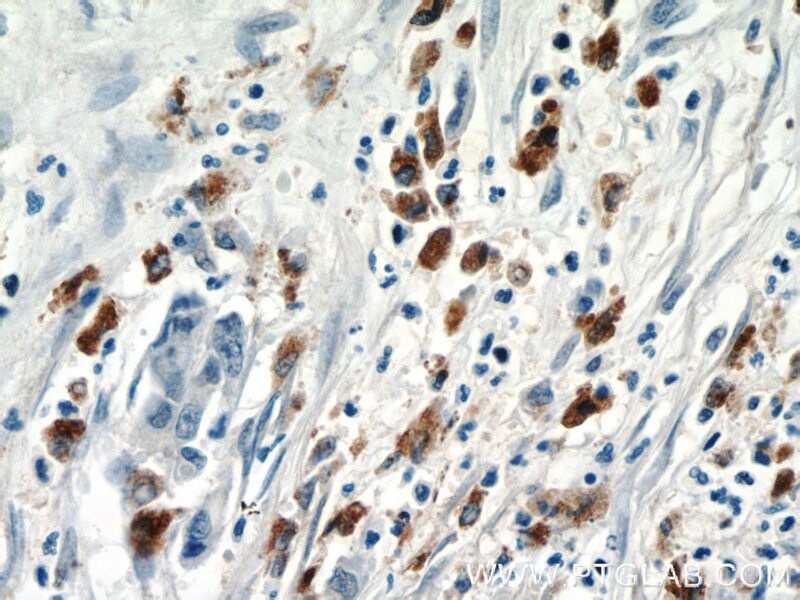 Unconjugated extracellular ISG15, which are released from several types of human and murine cells, are known to possess cytokine-like activity. 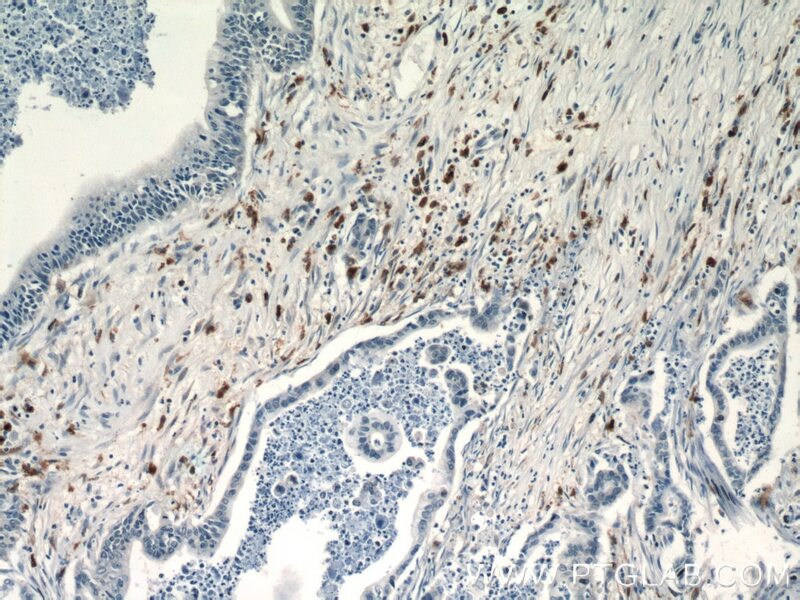 ISG15 promotes esophageal squamous cell carcinoma tumorigenesis via c-MET/Fyn/β-catenin signaling pathway. Restriction of HCMV replication by ISG15, a host effector regulated by cGAS-STING dsDNA sensing. Distinct temporal roles for the promyelocytic leukaemia (PML) protein in the sequential regulation of intracellular host immunity to HSV-1 infection. Mammalian Adaptation of an Avian Influenza A Virus Involves Stepwise Changes in NS1. The S Genome Segment Is Sufficient to Maintain Pathogenicity in Intra-Clade Lassa Virus Reassortants in a Guinea Pig Model. 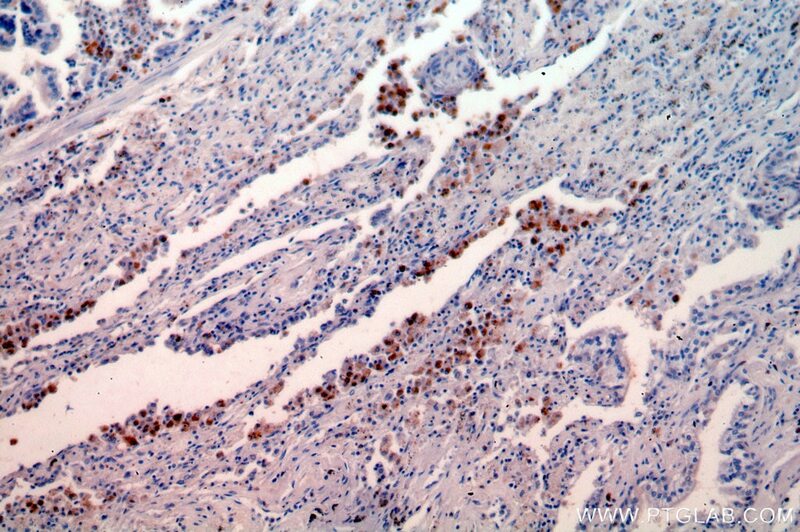 The Overexpression of CD80 and ISG15 Are Associated with the Progression and Metastasis of Breast Cancer by a Meta-Analysis Integrating Three Microarray Datasets.